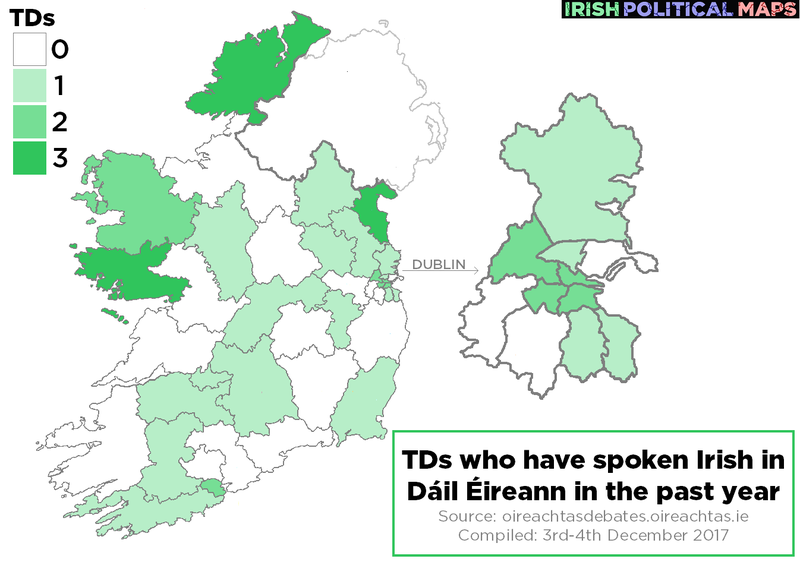 Irish Political Maps: How many TDs have spoken Irish in Dáil Éireann in the past year? How many TDs have spoken Irish in Dáil Éireann in the past year? On yesterday's The Week in Politics, newly minted Minister for Culture, Heritage and the Gaeltacht was quizzed by host Áine Lawlor on her own grasp of Gaeilge. Madigan confessed that, while she has a little bit of Irish, she hadn't engaged with the language since her Leaving Certificate thirty years ago. Asked if she might re-learn the language now that she holds the Gaeltacht portfolio, the minister replied that while she would "probably" try to improve, she would not make a promise to study it. Given that she is the minister responsible for the promotion of the Irish language, Madigan's comments caused a bit of a stir. The simple fact is, however, that she is far from the only TD who has had little engagement with the language. While a survey of TDs' knowledge of Irish would likely only result in the answers they would like to give, I decided to do some quick research into the Dáil debate archives in order to find out how many sitting TDs have spoken Irish in the Dáil in the past twelve months. In conducting this search I only counted instances of Irish being used naturally in place of English. References to the Ceann Comhairle, including the line "Go raibh maith agat, a Cheann Comhairle" have been omitted, as have instances where Irish was only used in brief procedural language to announce a motion or to declare whether a vote passed or was defeated. Of the 158 sitting members of the Dáil, only 37 have spoken Irish during parliamentary business in the past year. 10 are Fianna Fáil TDs: Aindrias Moynihan (Cork North West), Micheál Martin (Cork South Central), Pat the Cope Gallagher (Donegal), Jim O'Callaghan (Dublin Bay South), Éamon Ó Cuív (Galway West), Seán Ó Feargháil (Kildare South - currently Ceann Comhairle), Declan Breathnach (Louth), Dara Calleary (Mayo), Thomas Byrne (Meath East) and Eugene Murphy (Roscommon-Galway). 10 are Sinn Féin TDs: Caoimhghín Ó Caoláin (Cavan-Monaghan), Donnachadh Ó Laoghaire (Cork South Central), Pearse Doherty (Donegal), Mary Lou McDonald (Dublin Central), Louise O'Reilly (Dublin Fingal), Dessie Ellis (Dublin North West), Aengus Ó Snodaigh (Dublin South Central), Gerry Adams (Louth), Peadair Tóibín (Meath West) and Carol Nolan (Offaly). 9 are Fine Gael TDs: Jim Daly (Cork South West), Joe McHugh (Donegal), Kate O'Connell (Dublin Bay South), Leo Varadkar (Dublin West), Mary Mitchell O'Connor (Dún Laoghaire), Sean Kyne (Galway West), Patrick O'Donovan (Limerick), Fergus O'Dowd (Louth) and Enda Kenny (Mayo). 3 were Labour TDs: Joan Burton (Dublin West), Jan O'Sullivan (Limerick City) and Brendan Howlin (Wexford). 3 were Independent TDs: Maureen O'Sullivan (Dublin Central), Catherine Connolly (Galway West) and Mattie McGrath (Tipperary). 1 is a Solidarity-People Before Profit TD: Bríd Smith (Dublin South Central). 1 is a Green Party TD: Catherine Martin (Dublin Rathdown).